Thu., June 28, 2018, 10:20 a.m.
ARLINGTON, Va. – Instead of cashing in on another productive postseason performance, Devante Smith-Pelly took less money and a one-year deal to stay with the Washington Capitals. 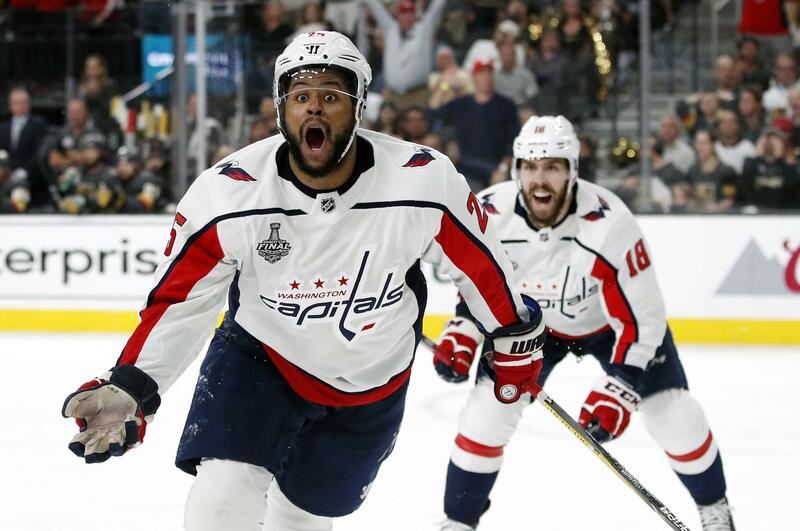 Smith-Pelly signed a $1 million contract for next season Thursday to return to the team he helped win the Stanley Cup by scoring seven playoff goals. The 26-year-old third-line forward turned down other one- and two-year offers for more money to give himself some stability in a place he feels comfortable. Smith-Pelly, who was not even a lock to make the opening-night roster, was one of the Capitals’ most important playoff players. The Toronto native had seven goals and nine assists in 75 regular-season games and then had two game-winners during his scoring tear in the playoffs. After New Jersey bought out Smith-Pelly last summer, he signed a two-way, league-minimum contract worth $650,000 in the NHL and $350,000 in the American Hockey League. Capitals general manager Brian MacLellan called Smith-Pelly a “project,” buying low on a 2010 second-round pick who scored five goals for Anaheim in the 2014 playoffs but kept bouncing around. Smith-Pelly has 40 goals and 53 assists for 93 points in 341 regular-season games with the Ducks, Montreal Canadiens, Devils and Capitals. Smith-Pelly was ready to stop the career carousel. The Capitals wanted him back even after not giving him a qualifying offer Monday as a restricted free agent. Doing so at a cost of $715,000 would have opened them up to an arbitration case and, at the very least, kept Smith-Pelly’s salary-cap hit an unknown until the hearing in July or August. It didn’t get to that point. The team continued to negotiate with agent Eustace King, and Smith-Pelly was more than happy to take a chance on putting up bigger numbers going into unrestricted free agency in the summer of 2019. Re-signing Smith-Pelly is the latest move on MacLellan’s offseason checklist after already locking up defenseman John Carlson to a $64 million, eight-year deal. The Capitals still need to hire a coach to replace Barry Trotz – with top assistant Todd Reirden considered the leading candidate – and are attempting to re-sign defenseman Michal Kempny. Published: June 28, 2018, 10:20 a.m.